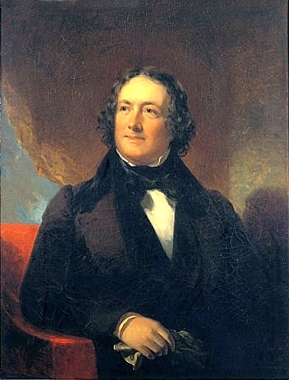 Nicholas Biddle, a friend of Joseph Bonaparte, was a prominent Philadelphia lawyer, politician, man of letters, gentleman farmer and the president of the Second Bank of the United States. As a young man, he encountered Napoleon in person. Biddle’s time in Europe persuaded him of the superiority of his own country. Biddle came to ruin in the 1830s Bank War with President Andrew Jackson. Nicholas Biddle was born in Philadelphia on January 8, 1786 to a family whose ancestors had come to America with William Penn. Biddle’s father, Charles, was a wealthy merchant and the vice president of the Supreme Executive Council of Pennsylvania. Young Nicholas was extremely bright, so much so that he entered the University of Pennsylvania at age 10. When – upon completion of his coursework – he was denied a degree because he was so young, he went to Princeton, from which he graduated when he was 15. He then studied law. In 1804 Biddle obtained a position as an unpaid secretary to General John Armstrong, a family friend who had been appointed the United States minister (ambassador) to France. Arriving in Paris in November, Biddle met James Monroe, who was there as a commissioner negotiating the Louisiana Purchase, as well as the Marquis de Lafayette, with whom Biddle formed a lasting friendship. Biddle also attended Napoleon’s coronation on December 2. In 1805, Biddle toured eastern France, Switzerland and Italy. In 1806, he went to Greece, where he became so enamored of classical literature and architecture that he later became known as “Nick the Greek” by his fellow Americans. Biddle then travelled along the Rhine and through Holland before arriving in England in March 1807. There he served as a temporary secretary to James Monroe, who was then the US minister to Great Britain. Biddle’s time in Europe convinced him of America’s superiority, both in terms of its physical beauty (something he tries to persuade Napoleon of in Napoleon in America), and in political terms. In the fall of 1807 Nicholas Biddle returned to the United States, where he continued his legal education. He was admitted to the bar in 1809. Besides his legal interests, Biddle had an affinity for literature and the fine arts. He contributed papers to several publications, including a prominent Philadelphia literary and political magazine called The Port Folio. When the magazine’s founder died in 1812, Biddle took over the editorship for two years, under the pseudonym Oliver Oldschool. In 1810 Biddle was elected to the Pennsylvania state legislature. He also – at William Clark’s request – began editing the notes from the Lewis and Clark expedition to the Pacific Coast. Fearing he was neglecting his legislative duties by spending too much time on the project, Biddle relinquished his role in the publication in 1811. Thus he is not credited in the History of the Expedition of Captains Lewis and Clark (Philadelphia, 1814), though he did a considerable amount of work on the manuscript. In 1814, Nicholas Biddle was elected to a four-year term in the Pennsylvania senate. Jane urged him to run for Congress, but Biddle lost. In 1819, his friend James Monroe – now President of the United States – made Biddle a director of the Second Bank of the United States. In 1822, Biddle became the Bank’s president. Biddle successfully led the bank until 1832, when President Andrew Jackson vetoed the bill to renew the Bank’s charter. Jackson believed that the Bank – and thus Biddle – held too much power, though other powerful politicians, notably Henry Clay and Daniel Webster, supported the Bank. In 1833, in an attempt to undermine the Bank’s credibility, Jackson withdrew all the government deposits. He continued the “Bank War” until Biddle finally resigned his position in 1839. In 1841, the Bank closed, swallowing Biddle’s personal fortune. The following year Biddle was arrested and charged with fraud. Though he was acquitted of the charges, Biddle was deeply depressed by the Bank’s failure and his public disgrace. He retired to Andalusia – which, in the 1830s, he had renovated in Greek revival style – and devoted himself to farming. Biddle was a member of the Philadelphia Society for Promoting Agriculture, and Andalusia had long been the scene of his agricultural experiments, notably the cultivation of grapes. Biddle was also a member of the American Philosophical Society, the Philadelphia Academy of Fine Arts, the Historical Society of Pennsylvania and the American Philosophical Society. Biddle played an instrumental role in the establishment of Girard College, a boarding school for poor, orphaned or fatherless white boys founded with money bequeathed by Stephen Girard. Nicholas Biddle died in Philadelphia on February 27, 1844, from clinical depression and bronchitis. He was 58 years old. Jane died on August 11, 1856, age 63. She and Biddle are buried in St. Peter’s Episcopal Churchyard in Philadelphia. Nicholas B. Wainwright, “Glimpses of Napoleon in 1804,” Pennsylvania Magazine of History and Biography, Vol. 102, No. 1 (Jan. 1978), pp. 106- 107. Anne Felicity Woodhouse, “Nicholas Biddle in Europe, 1804-1807,” Pennsylvania Magazine of History and Biography, Vol. 103, No. 1 (Jan. 1979), p. 27. Nicholas Biddle, An Address Delivered Before the Alumni Association of Nassau-Hall (Princeton, NJ, 1835), p. 7. Nicholas B. Wainwright, “Andalusia, Countryseat of the Craig Family and of Nicholas Biddle and His Descendants,” Pennsylvania Magazine of History and Biography, Vol. 101, No. 1 (Jan. 1977), p. 25. Edward Biddle, “Joseph Bonaparte as recorded in the Private Journal of Nicholas Biddle,” Pennsylvania Magazine of History and Biography, Vol. 55, No. 14 (1931), p. 208. John Jay Smith, Recollections of John Jay Smith (Philadelphia, 1892), p. 206. Vincent Nolte, Fifty Years in Both Hemispheres, or Reminiscences of the Life of a Former Merchant, translated from the German (New York, 1854), p. 439. Wainwright, “Andalusia, Countryseat of the Craig Family and of Nicholas Biddle and His Descendants,” p. 26. Sounds like a homework question, which you’ll have to do some more research or talk to your teacher to answer. Good luck! Two or three times [Napoleon] picked his nose very impolitely with his fingers, he gaped, & stroked his face. As soon as the last line passed him he jumped from his horse and came into the Palace.